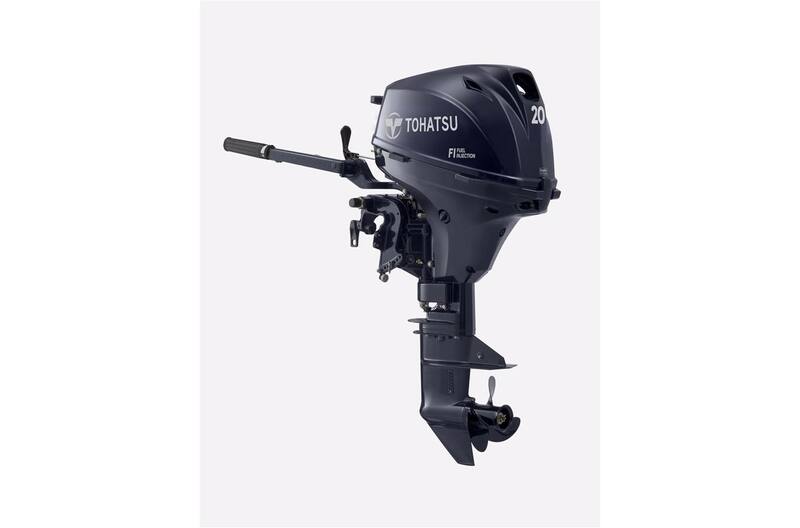 Boasting the honor of the lightest weight outboard in its class, Tohatsu's newly designed MFS 20hp Electronic Fuel Injection (EFI) is a great choice for a wide variety of boaters. Just because it is lighter in weight than our previous 20hp four stroke, doesn't mean this model won't deliver the same level of performance. This 20hp battery-less electronic fuel injection four stroke has exceptional torque and top end speed, with low vibration. We chose to build an EFI outboard because it has easy startup with no choke required and smooth, crisp acceleration throughout all RPM ranges. Another added benefit of an EFI versus our previous carbureted outboard is the fuel efficiency at wide open throttle, which allows you to go up to 50% farther on less fuel. Also available on many models is the Power Tilt feature. The 20 hp Power Tilt is ideal for inflatable, fishing, and pontoon boats. The uniquely designed engine improves functionality and convenience with its light power tilt and transom bracket. Now you can tilt your motor out of the water with just the push of a button. Simplify your boating experience with a power tilt model. Try our new 20hp EFI for the ultimate boating experience because you don't deserve anything less. Multi-Function Tiller Handle: Stop Switch, Front Shift, Friction Adjusting Screw and Power Tilt Switch (PTS: on power tilt models only) are integrated into the tiller handle for convenience. Fuel Water Separator: A high quality, user-friendly fuel water separator is standard equipment on all EFI 20 | 15 | 9.9 motors. This unique yet simple fuel water separator doesn't require the use of a single tool to drain the water. Stowable Carrying Handle: We've incorporated a carrying handle on the front that can easily be tucked away when not in use. Center of Gravity Improved: By moving heavy components (i.e. crankshaft, driveshaft) 30mm forward compared to the previous model, the tilting weight has decreased by 26% from the previous version, making it much easier for users to tilt manually. Compact Fuel System Layout for Easy Maintenance : The Vapor Separator Tank (VST) has been designed to integrate the high pressure fuel feed pump, regulator, and fuel cooler into one component. Propeller Selection Range: 6 in. - 10 in. Transom Height: 15 in., 20 in. * Weight specification is based on the lightest version. ** FC-W® is a registered trademark of the National Marine Manufacturers Assoc. (NMMA) Specifications and descriptions are subject to change without notice.